UK, 1952-54, 73 minutes, Colour. Voices of all the Animals: Maurice Denham. Directed by John Halas and Joy Batchelor. 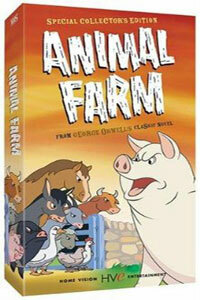 Animal Farm was a successful film version of George Orwell's famous fable. At the same time there had been an unusual version of Orwell's 1984, filmed as science fiction and as political melodrama. The team of Halas and Batchelor worked on this animated version of Orwell's fable for several years It tried to avoid something of the cuteness of the Disney style of animation. However, it did not avoid it entirely. It is closer to Disney than some of the more stylised animation films that were to emerge during the 60s and 70s. The message of Animal Farm is fairly straightforward and people can recognise some of the history of communist and socialist revolutions in the 20th century. Orwell has a wry sense of humour in indicating that social revolutions are not permanent. One of the notable characteristics of this version of Animal Farm is the fact that Maurice Denham vocalises all the voices of the animals. Worth seeing in connection with a reading of Orwell's novels. 1. The reputation of George Orwell, his social commentary in literature? How well has the basic impact been transferred to the screen? The basic appropriateness of the animation to communicate the fable? The impact of Orwell's message early in the twentieth century, now? How valid have his insights been proved? 2. How appropriate was the style of animation for an Orwell story? Use of colour, use of setting, the realism of the animal and humans? The caricature, the comic strip style? The comic touches? Overtones of Disney? The use of music? The appropriateness of Maurice Denham's voice for all the animals? The use of the commentary? 3. Is animation the main way to communicate fables from the screen? How would it have been communicated in a more realistic fashion? What is the basic effect of fable? Audience response to the animation, the animals, the plot, the message? 4. Animal Farm as a commentary on the 20th century and its social conditions? The insight into capitalism, its running and its effect on people, economy. political? The insight of Animal Farm into socialism? Necessity? The nature of revolution? The innate drives of human nature for capitalism and socialism? 5. The presentation of Farmer Jones and his oppression? The details, the reference to political societies of the 20th century? His brutality, drunkenness, collaboration with the other farmers? 6. The presentation with the old pig and his drawing all the animals to his final meeting? The nature of his bequest? The chance for the audience to see the various animals, the spirit of Animal Farm, the main characters amongst the animals? The details of the meeting, the animals reaction to Farmer Jones oppression, the wisdom of the old pig before he died? The emphasis on the pigs in the front row? 7. The emergence of Snowball and Napoleon? The character of each pig? Snowball and his toadying to Napoleon? Leading ultimately to his downfall and death? Napoleon as the picture of sheer arrogance and cruelty? His various devices to trick the other animals? His getting of the pups and keeping them in the house for later police work? His ambitions and his control? A parallel between historical figures? 8. The enthusiasm of socialism and equality? A co-operative farm? All the animals feeling equal, working equally? The pride in the constitution written on the wall? The irony of its latter changes, the overnight changes? 9. The presentation of the farmers and their siege, the animals rallying to repel them? The spirit of Animal Farm in repelling the capitalistic attackers? 10. The contrast with Napoleon's rule, his affluence, his soft life and sleeping in beds? His dogs and their harsh cruelty? Snowball's death as an illustration of this? 11. The transition to slave work by the animals, especially Boxer? The revolution against the pigs and the savage reprisals against the animals who revolted? 12. The atmosphere of trade with the outside world, of sabotage, rebuilding, the continuing of slave labour? What had the animals gained and lost? 13. The impact of Boxer's removal? Boxer's influence throughout this period, his keeping them going when the work was impossible? The insight that the animals gained when Boxer was removed? 14. The famous theory that all animals are equal but some more equal than others? Its presentation within context? The creed of the pigs, the attitude of the other animals? The revolutionary cycle and the socialistic and capitalistic facets coming through once again? 15. How insightful were the comments on society of the 20th century, the basic attitudes of human nature, greed and competitiveness and control? Moral comments, political comments? 16. What was the achievement of this animated film in its techniques, the techniques communicating serious messages?